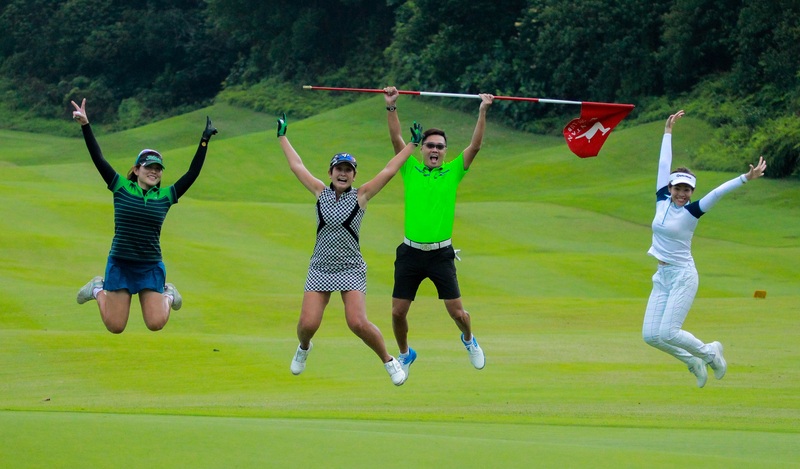 An anniversary is certainly a cause for celebration, and in the instance of the Ria Bintan Golf Club, 20 years of successfully drawing golfers of all nationalities to experience a round or two on one of the best golf courses in Indonesia. And so they came, and on arrival were greeted to Ria Bintan’s own staff dancing in choreographed unison to the strains of Waka Waka by Shakira. Guests were warmly welcomed, and there were smiles and handshakes all around. The golf carnival was off to a rousing start and promptly got underway with the 20-Hole Par 3 Challenge. Golfers were encouraged to dress for the occasion, either in the colours of the RB20 logo of green and blue, or in retro golf fashion circa 1950’s to the 1970’s. The best dressed lady winning a facial and spa gift set, and the best dressed man and flight each winning complimentary green fees to Palm Spring Golf & Country Club. The point of the 20-Hole Par 3 Challenge? 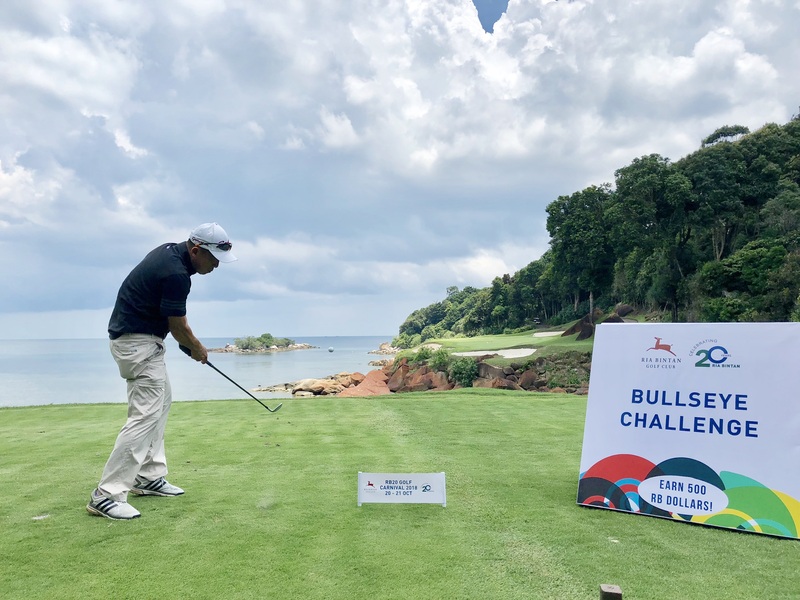 Aside from scoring well enough to win, plainly, to have fun; and at the same time hone in on the target at several holes designated with the Bullseye Challenge, earning RB500 dollars (that’s Ria Bintan dolllars) each time a golfer enters the bullseye. The club currency earned to be used during the night’s festivities to bid for auction prizes. 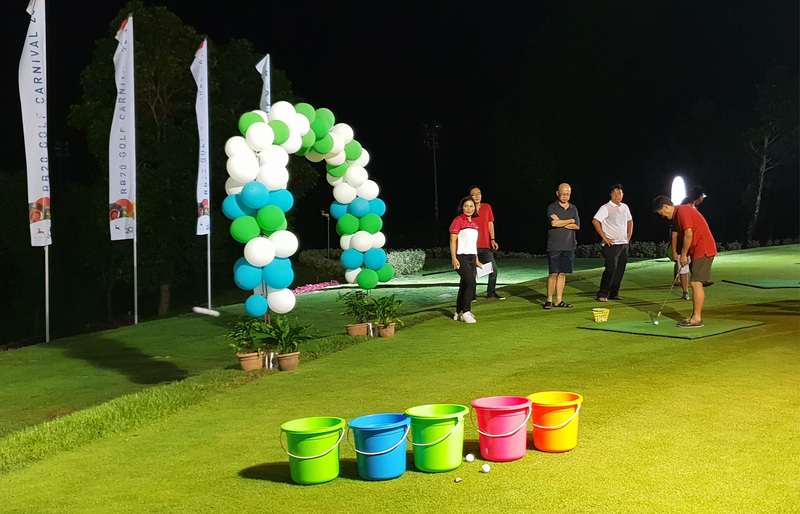 With the fall of night, golfers were treated to a barbecue dinner after which they gathered in teams of five for the lights, colours and game stalls set up for the Night Carnival. 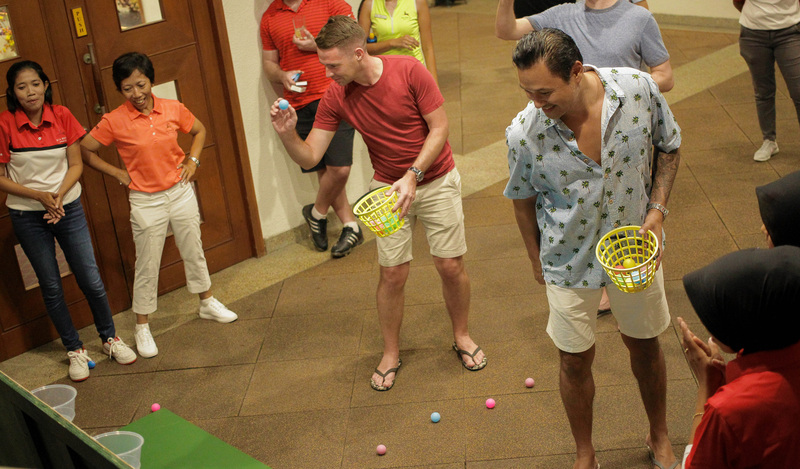 With games like Chip-In Pails, Tee It Up, Vertical Pong, Luck for Putt, and Putt Tic-Tac-Toe, more RB dollars were earned amidst the laughter, cheers, and beers. The prize auction with 9 mystery prizes, each behind the letters of ‘Ria Bintan’ were up for bidding next. Led by the hilarious emcee, the bidding hotted up as the prize won behind the first selected letter ‘R’ was revealed to be a Callaway Odyssey Black putter. There were other low bids that were surprised with great prizes like the TaylorMade Spider Mini Putter and Cobra Puma Driver, and high bids that drew laughter as the booby prizes were revealed. Yet the bids kept coming as teams began to pool their hard-won RB dollars to gun for the top prize of a limited edition watch. The next morning saw the tournament proper take place, all golfers sharper for having practiced their skills the day before through 20 par 3s and the Night Carnival game stalls. The lunch conclusion of the RB20 Golf Carnival weekend saw Cleo Ang taking best gross and Ng Ming Loo winning best nett for the ladies division; best gross for members was Peter Khong, Atsushi Yamada topped the member’s division for best nett, men’s division B best gross went to Peter Khong, and best nett to Alvin Tan, men’s division A best nett winner was Ho Chien Mien; with the biggest tournament winner being Jack Hemsley, who swept the 20-Hole Par 3 Challenge, best gross for division A, and overall champion for the RB20 Golf Carnival. 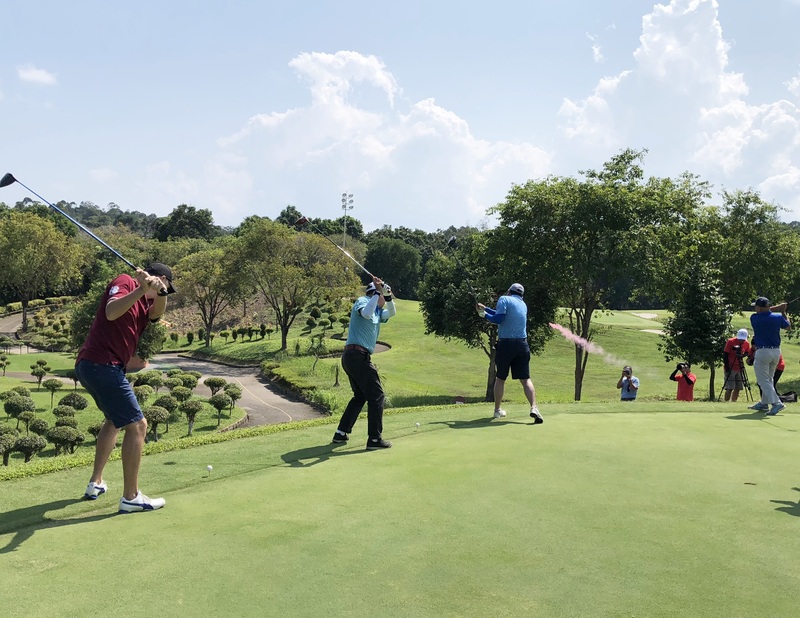 The biggest winners though were the golfers, as Mr. Levend Arisoy, General Manager of Turkish Airlines Singapore enjoyed himself so much over the 2-day event that he gave away an extra prize impromptu, of another round trip ticket to any European destination. 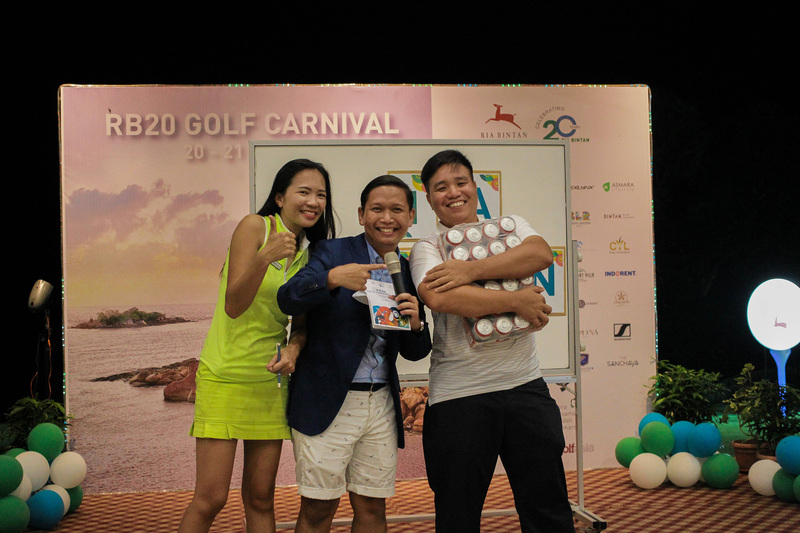 And young Ayden Teo, who apart from winning many a heart with his shy smile, went home with the title of best junior golfer, a Callaway Odyssey Black putter from the prize auction, and the top lucky draw prize of a 3D2N Club Med trip for 2, whom Mr. Bruno Courbet, the Club Med Director of Indonesia, Thailand, India and new markets, commented that there couldn’t have been a better representation of Club Med’s family values than young Ayden.